This article mainly concerns how to convert AVCHD video to MP4 format with the shortest time and best preserved HD quality. By assistance of the versatile AVCHD to MP4 converter software - VideoProc, you can convert video from AVCHD to MP4 format freely and easily. Moreover, you can even get enhanced video quality in extraordinarily short conversion time. You might just purchase an AVCHD Camcorder like Sony Handycam HDR-PJ620/CX240, Panasonic HC-W580 or Canon Vixia HF R72 and shot some AVCHD video with .mts, .m2ts or .ts file extension. AVCHD is the new high definition video format for HD camcorder recording and playback, which stands for Advanced Video Codec High Definition and is jointly developed by Sony and Panasonic. Though some brands of HD camcorder also employ MPEG-4, they are not as popular as AVCHD video anyway. Then, you'd better prepare a AVCHD converter software. MP4 is an abbreviated term for MPEG-4 Part 14. It may also be referred to as MPEG-4 AVC, which stands for Advanced Video Coding. As the name suggests, this is a format for working with video files and was first introduced in 1998. Both MP4 and AVCHD video are container formats, and they utilize MPEG-4 AVC compression codec. So conversion from AVCHD to MP4 can avoid HD recordings data loss. That means by converting AVCHD to MP4, you can get the same excellent video quality comparing to original. -	Convert video: Convert AVCHD video and almost any video to MP4, FLV, AVI, WMV, MOV, H.264, HEVC, iPhone (XS), iPad, Android, etc. 1. To convert AVCHD to MP4 with proper parameter settings, you are allowed to play AVCHD video on iPhone, play AVCHD video on iPad, iPod (iTouch), Zune, Xbox and other portable devices. Since MPEG-4 technology has been developed to provide DVD quality audio and pictures in an extremely small file size - ideal for playing on portable MP4 players such as the iPod Video. The Apple Corporation themselves describe MP4 as "the global multimedia standard, delivering professional-quality audio and video streams over a wide range of bandwidths, from cell phone to broadband and beyond". 2. To convert AVCHD video to MP4 format, you can not only match up the video with much more supported media players (comparing with AVCHD Player), but also have a wilder range of video editor software options (we know AVCHD editors are always expensive and require high-end computer). 3. After converting AVCHD to MP4 format, you can easily play AVCHD recordings on Windows PC or play AVCHD video on Mac (MP4 format video is friendly to both Windows Media Player and Mac QuickTime Player). How to Convert AVCHD to MP4 on Windows (10) with Fastest AVCHD to MP4 Converter? 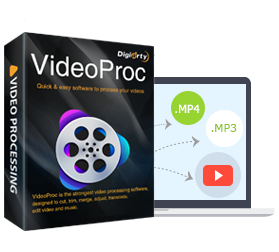 Firstly you can free download VideoProc and install it on your PC or Mac. Step 1: Load your target AVCHD video into this AVCHD to MP4 converter by clicking +Video button. Or you can directly drag your AVCHD footage into the Instruction Panel to import. Step 2: Choose General Video from OutPut Profile Category to choose MP4 Video. Click OK. Step 3: Select the output saving folder by clicking Browse Button. Step 4: Start AVCHD to MP4 conversion by clicking RUN button.